I’m on the program committee for Information ONLINE 2013. Kate Davis dobbed me in. Currently we are still trying to tie down keynotes so we can tell you who they are. One thing I am allowed to say is that they’ll be different. We’ve all been asked to keep this blog alive on a regular basis, so this is my first post. I think my theme will be posts about being a bit different. Then again, I reserve the right to change my mind at any stage. Now I sometimes wonder whether that current has not become too strong and whether there would be sufficient opportunity for a full life if the world were emptied of some of the useless things that give it spiritual significance; in other words, whether our conception of what is useful may not have become too narrow to be adequate to the roaming and capricious possibilities of the human spirit. … the really great discoveries which had ultimately proved to be beneficial to mankind had been made by men and women who were driven not by the desire to be useful but merely the desire to satisfy their curiosity. Out of this useless activity there come discoveries which may well prove of infinitely more importance to the human mind and to the human spirit than the accomplishment of the useful ends for which the schools were founded. Justification of spiritual freedom goes, however, much farther than originality whether in the realm of science or humanism, for it implies tolerance throughout the range of human dissimilarities. 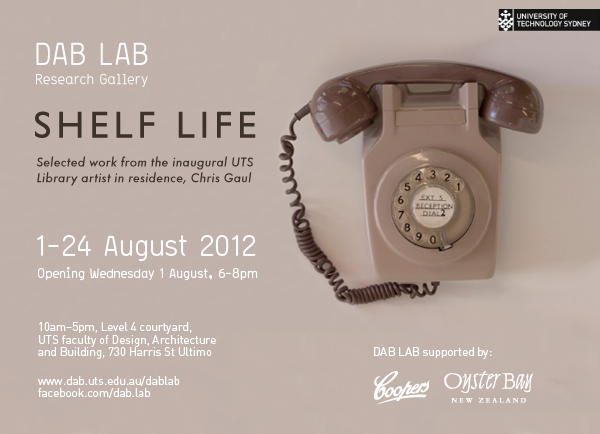 On 1 August 2012 our first Artist-in-Residence, Chris Gaul, opened his Shelf Life exhibition in the DAB LAB Research Gallery. I think Abraham and Chris would get on swimmingly. Chris has helped us to understand beyond what we know, he has given us fresh new perspectives on our challenges and presented us with stimulating original ideas to encourage the curiosity of our clients. What if you could wear a pair of headphones and wander library shelves listening to the babble of books reading themselves aloud? What if you could tune into different frequencies of books, or use their Dewey call numbers to call them on the telephone?